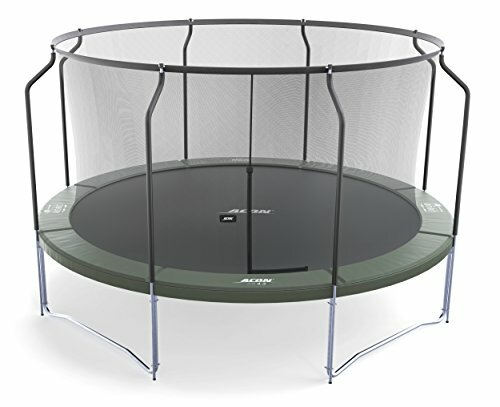 The ACON Air 4.6 is a 15 ft. diameter round heavy duty trampoline built to last. Designed for both kids and adults, the ACON Air 4.6 comes with a 5 year warranty on its sturdy frame. This quality trampoline is designed for year round use. Jump all you can in the summer heat and in the winter snow and cold. There is no need to take this trampoline down in the fall, keep it up year round. All replacement parts are kept in stock. Your getting thicker pipes, highest rated springs, the best sewn mat, a thicker foam spring pad and an enclosure that fits tight to the mat. The ACON Air 4.6 includes 110 heavy gauge galvanized springs with a spring preload of 69 N. Each spring measures 8.5 inches allowing big Air. Galvanized frame pipes inside and out. Included is a high quality enclosure that fits tight to the trampoline mat inside the springs. The only way off this trampoline is through the door. This trampoline is designed to Last. Designed in Finland. Trampoline and Enclosure weight 295 lbs. | Trampoline height 36 inches. | 6 times cross sewed polypropylene UV treated mat. Galvanized frame pipes both inside and out. | Frame pipe diameter 2 inches. | Pipe thickness .08 inches. If you have any questions about this product by Acon, contact us by completing and submitting the form below. If you are looking for a specif part number, please include it with your message.